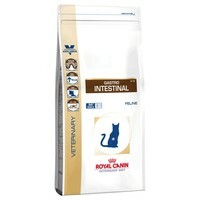 Royal Canin Gastro Intestinal Dry Food for Cats is a nutritionally complete vet diet to promote nutritional restoration and convalescence in cats with acute and chronic digestive disorders. High Energy: Fulfils increased energy requirements while reducing the amount of food given per meal, decreasing the digestive workload. Also promotes weight regain during convalescence. Excellent product, my 2 cats are 14 and have suffered with upset stomachs, my vet recommended this food and they have had a new lease of life, more energy and healthy coats. One of my cats developed a very sensitive stomach after she had a parasite. We tried lots of different foods but nothing really worked until the vet suggested this. We were buying it from the vets at a much higher price until a friend suggested VetUK. It is now her permenant food, she really enjoys the taste and we have had no more upset tummy. I also feed it to my other cat who has no stomach problems and he seems to be thriving on it just as well. I have 5 cats, 2 with really sensitive stomachs, this food sorts them out straight away. If a sudden bout of diarrhoea comes on, I dont have to mix this through over days, just put them on it. All cats do well on this long term with no weight gain. It is expensive, but it does a much better job than the slightly cheaper royal canin alternatives, for my cats anyway. My Cat has IBS and this is perfect for cats with unsettled stomachs. There is nothing in it that irritates his stomach. It is excellent value for money for a specialist diet.